In an extremely competitive championship meet, USC senior Haley Anderson and sophomore Haley Ishimatsu took home three individual titles, while the No. 1 Trojans placed seventh overall at the 2013 NCAA women’s swimming and diving championships in Indianapolis. Anderson secured USC’s first-ever NCAA title in the 1650-yard freestyle with a time of 15:45.98 on the final night of the meet and captured her second-straight NCAA crown in the 500-yard freestyle on the first night. Ishimatsu ran away with the platform title behind her NCAA record 396.75 points on night three and became the third Trojan to win an NCAA diving title. The Women of Troy finished with 291 points in a field of 40 schools to land in the NCAA top seven for the fourth-straight year. In both of the previous two years, USC placed third overall. Georgia won the team title with 477 points, while California, which had its two-year title streak snapped, finished second with 393. In the 1650-yard freestyle final, Anderson fought off Sarah Henry, the top seed from Texas A&M, who pulled within 0.81 with 50 yards remaining. Anderson ultimately took the win by 0.43. Ishimatsu, on the other hand, left her competition in the dust with her record-setting performance, winning by 68.15 points. She capped off her first career title with a two-and-a-half back somersault, one-and-a-half twist pike to score 84.80 points in her final dive. Ishimatsu now joins her sister, Victoria, as one of three Trojans with an NCAA diving title. 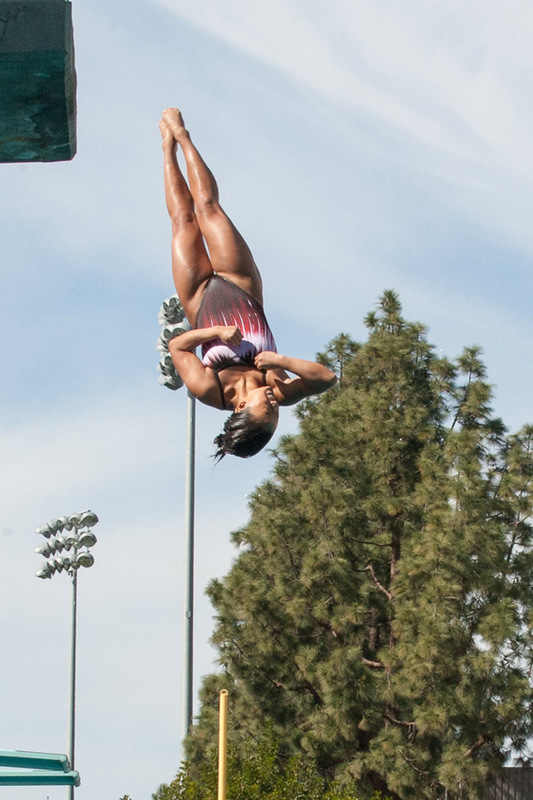 Ishimatsu also won platform titles in the 2013 Pac-12 and NCAA Zone E Championships. Along with Anderson and Ishimatsu’s efforts, sophomore Andrea Kropp and freshmen Jasmine Tosky and Kendyl Stewart all made final appearances on the last night of the championships. Stewart placed fourth in the 200-yard backstroke finals, setting personal and school records with a time of 1:51.28. She also tied for first in the 100-yard fly consolation final on Friday. After placing first in the 200-yard fly prelim, Tosky took fifth in the 200-yard fly with a 1:55.11 time and clinched her first NCAA individual points. Kropp set a personal record in the 200-yard breast prelim and finished seventh in the final. She was also a consolation finalist in the 200-yard individual medley. In the first night of the championships, juniors Stina Gardell and Meghan Hawthorne finished fourth and eighth, respectively, in the 200-yard individual medley finals, while junior Kasey Carlson placed seventh in the 50-yard freestyle relay. Though the Women of Troy collectively had strong performances, the team took a hit in the standings after its 400-yard medley relay was disqualified for a violation. On night two, Carlson also placed second in the 100-yard breast, while Gardell took fourth in the 400-yard individual medley. USC’s 200-yard medley and 800-yard freestyle relay teams both placed sixth.